491 Steps – Oh My! – Let's Go RVing! 491 Steps – Oh My! What a day! Jerry must have been really tired because he didn’t wake up until I woke him up a bit after 8:30. I had gotten up about 7:00 and could not get the coffee going so by 8:30 I needed a cup! Come to find out he had put the coffee in but got interrupted and forgot to put the water in. No wonder I couldn’t get it to work! About 9:00 I got a phone call from Janet about the July 4th party so after we talked a while Jerry and I finally got ready to go. By that time it was nearly 11:00, a late start for us. We decided not to take lunch but instead find some on the way. We took a winding road to the town of Chimney Rock. Gypsy tried to send us a very alternate way reminding us of our excursion into the Virginia countryside last year but we were a bit smarter this year so we turned around, reset the GPS and then were on our way. It is a pretty drive with apple orchards dotting the countryside although none are opened yet. When we got to Chimney Rock we just wandered around the town going in and out of shops. We always try to find some small trinket to remind us of our trip so we were sort of looking for that. We decided to eat at River Walk restaurant and we ate outside where we could look down on the river and the river walk. Our plans were to come back later and walk the river walk. Little did we know! The meal was absolutely delicious. 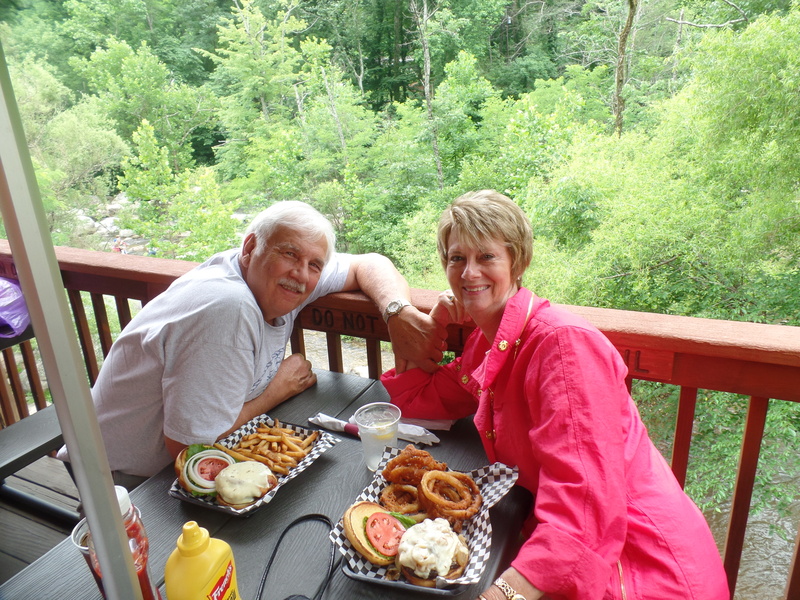 We both had hamburgers and we agreed that they were even better than Back Water Jack’s! I had onion rings and I don’t think I’ve ever ordered onion rings in a restaurant that tasted like Mom had cooked them. Boy, that brought back memories. They were definitely not frozen out of a bag. We headed on to Chimney Rock State Park where we were informed that the elevator was not working but we could climb up to the rock. That was not a problem since we had planned to do that anyway. Again, little did we know. 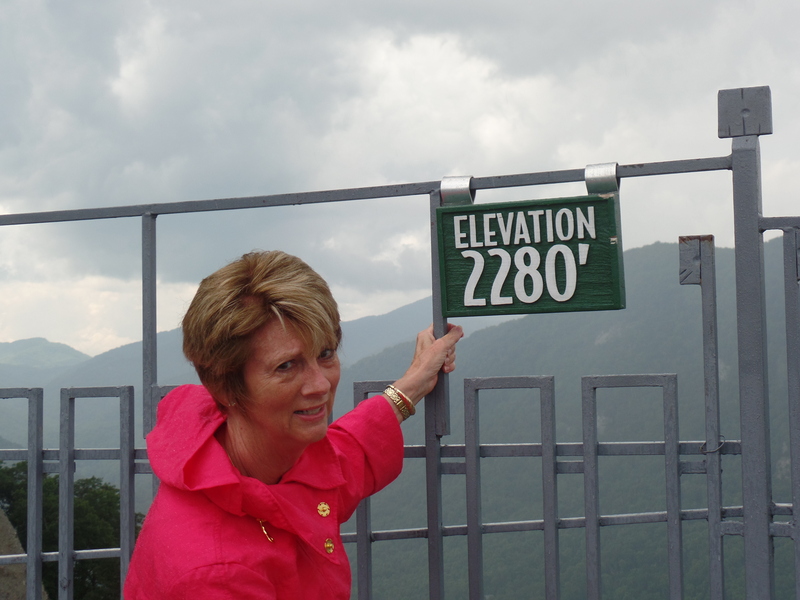 There are 491 stair steps to reach the top with platforms placed at various intervals – thank goodness for those. I wasn’t sure I would make it but we plodded on and indeed we did get to the top. As we were beginning the climb it looked like it might rain and indeed it did. Luckily I had on my rain coat but Jerry got a bit wet. Unfortunately because of the rain the view was a bit obscured. There is a lounge and gift shop at the top and I think Jerry would have bought a shirt with “I made it to the top of Chimney Rock” but he had left his wallet in the car so we had no money. Believe it or not climbing down 491 steps isn’t easy either although it is easier than going up. We stopped and went into a small cave. It was only opened for a short distance due to White Nose Syndrome (Bats). That’s the second time within a month that I’ve heard of White Nose Syndrome – guess what you hear depends on where you are and what you’re doing. We then decided to head on to Hickory Nut Falls Trail, described as a moderate hike. Apparently state parks and federal parks define moderate differently because we went on a moderate hike at Mammoth Cave with no problem but I honestly didn’t think I’d make it on this one. The grease from the onion rings was sitting heavily on my stomach and it was hot and I was tired! It’s only 1.5 miles but doing it right on the heels of climbing Chimney Rock was a bit much. We did it though and saw the beautiful falls. Tiny butterflies were flying around and one landed on Jerry’s shoulder. I was able to get the camera out of his pocket and snap a pic of it. I found out as we were walking that the camera on my phone has died and we had left Jerry’s good camera at home so all we had was my little Samsung. It’s not too bad! Going back was downhill but even at that it was a tough walk. We ended up in the parking lot only to realize that it was a level below where our car was so we continued walking. Although I was thirsty and needed to go to the bathroom when I saw the rocking chairs I immediately took a seat. Relief! Jerry went in the gift shop and bought a t-shirt. Earlier when we arrived John Mason was playing a hammered mandolin, an instrument I had never seen before. The songs were beautiful so I looked at some of his CD’s but decided against buying anything. On the way back to the campground we stopped at Ingles Grocery and bought burger for dinner planning to prepare beef stroganoff. When we got back Jerry kept saying he couldn’t stay awake. He finally got on the bed and slept until after 8:30. Needless to say we didn’t have dinner. He heated up some Brunswick stew for him but I wasn’t hungry so I went on to bed. It never occurred to me that I would have difficulty sleeping but I did. I drifted off about 10 and then woke up and couldn’t go back to sleep. I finally ended up on the sofa. It was a very tiring and exhausting day but it was a great day!